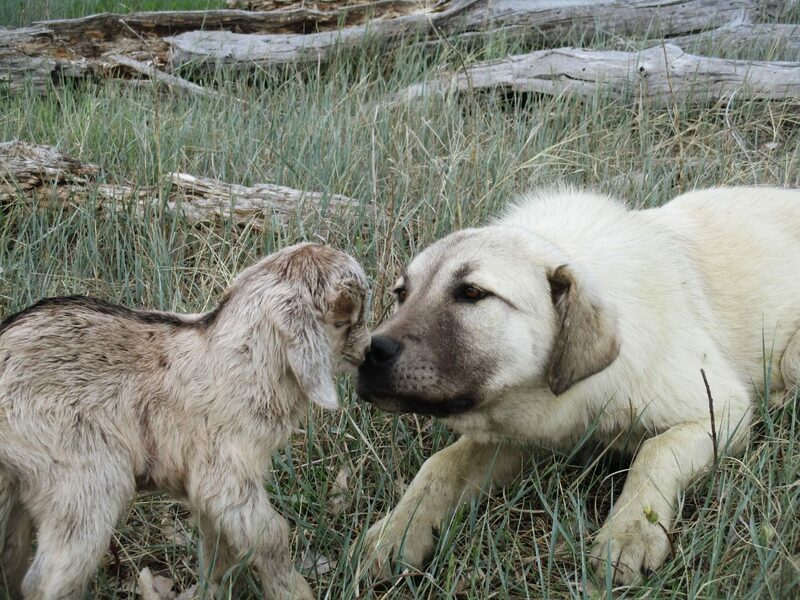 It was Love at first sight between this guard dog and the baby goat. Carolina Noya lives a simple, yet peaceful life. The Wyoming goat herder spends six months of the year out on the Wyoming prairie in a sheep wagon, with a herd of goats, several guard dogs and Mother Nature for company. Noya runs her business, Devils Tower Goats, herding goats through pastures, while keeping a watchful eye on them as they gobble up leafy spurge and other noxious weeds. It’s a way of life she enjoys. “I took a job as a goat herder 10 years ago,” Noya said. “I was a herder for one year, and then the owner of the herd wanted to sell. I ended up with over 1,000 goats. Everyone always tells you to start small, and I agree with that. When someone asks me about having so many goats, I tell them to start small, but think big. My advice is if you want 200, start with 20. It doesn’t take long to build up a herd, and it gives you an opportunity to see if this is something you really want to do long term, because you won’t get a return on your money right away. I’ve been at it 10 years now, and I still learn something new from them everyday,” she said. Noya shared a story from a few years ago when she took in 800 kid goats during the spring. “They came from Texas when there was a drought, and they had never eaten anything green. We put them out on pasture, and within an hour or two, they had learned what spurge was, and liked it. You don’t have to teach goats to eat it, they will go for it on their own. When they are out of spurge, they will start looking for a hole in the fence and follow it to the neighbors,” she said.